Sharing my love for sewing is something that I am passionate about. 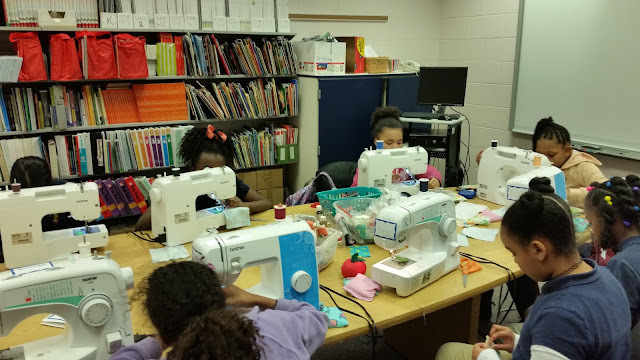 For the last 5 years, I’ve organized an afterschool sewing club for 5th graders at a local elementary school. This has been so much fun and so rewarding that I thought I would share with you some of the things that I did to get it started, and some of the things that I’ve learned along the way. 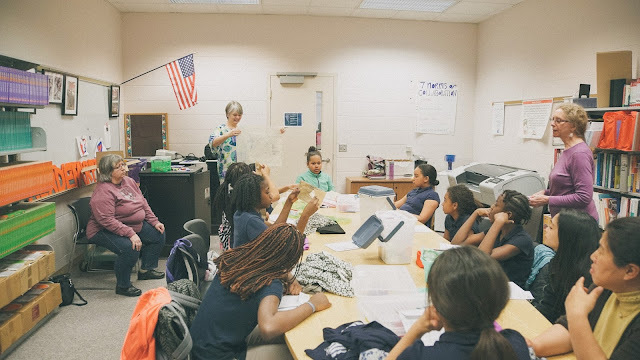 Pick a school that you think might be interested and call to speak with someone at that school in the administration, such as a principal or community involvement coordinator, to see if after-school clubs are possible. 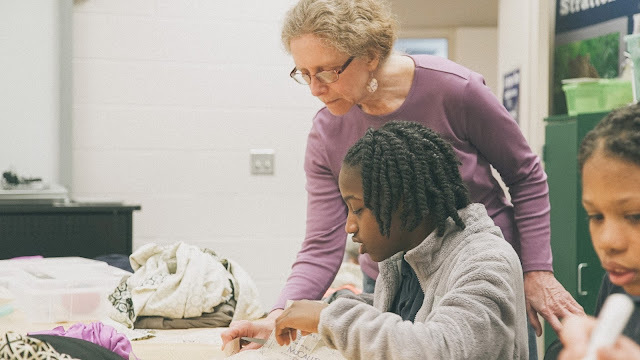 This may seem intimidating, but from my experience, school administrators are devoted to providing their students with enriching experiences, and will jump at the chance to expose their students to the art of sewing. 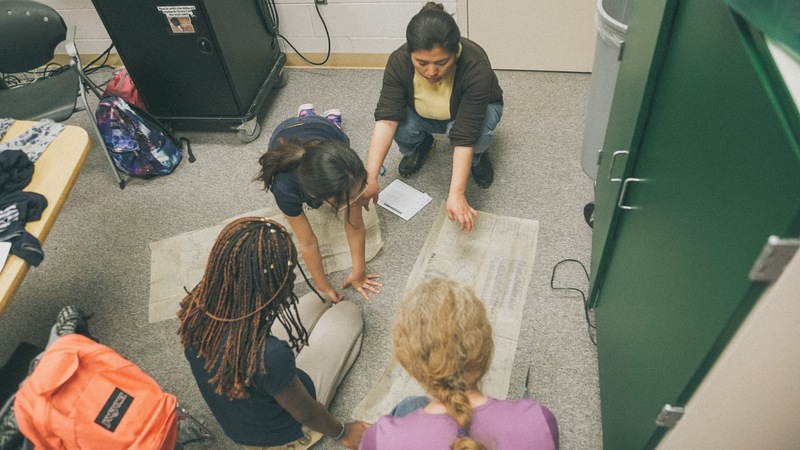 I chose to work with the 5th grade of an elementary school, but you could also do this with middle or high schools. I also decided that I would just do it in the second semester of the school year. I met with our principal, who was very excited by the idea and offered to support the club as much as possible. It is standard procedure in all schools to run background checks on anyone that would be working with students. So, don’t be offended if you are required to be fingerprinted, or asked for references. 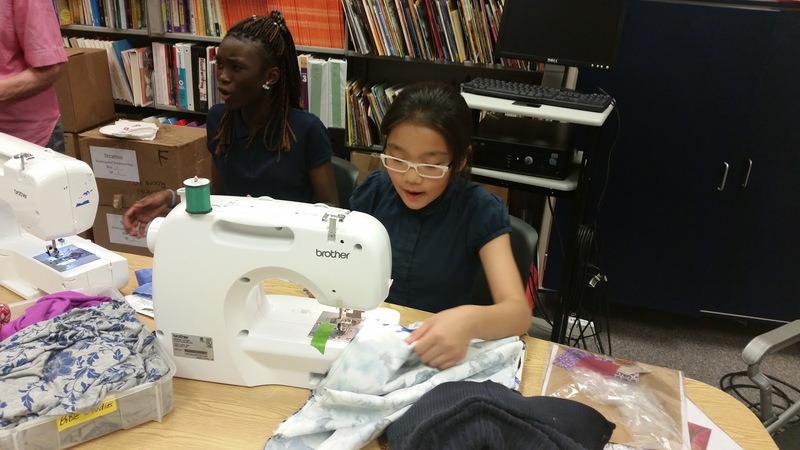 Some kids may not be familiar with sewing, and haven’t ever even seen a sewing machine. Offer to demonstrate how to use a sewing machine in a general class, and talk about what kinds of things you can do with a sewing machine. 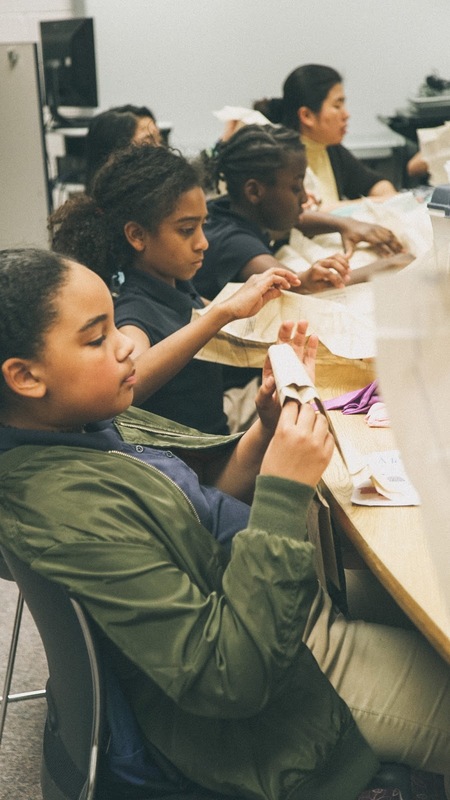 I have done this by going into a classroom during the school day, and letting each student have a chance to sew two small pieces of fabric together. I’ve done this both with general classrooms and art classes. Then, I tell them that I will be leading an after-school sewing club and ask them to talk to their parents about it if they are interested. Soon after the class demonstration, work with the administration/teachers to send home information about the sewing club to parents, along with a permission form. Include the day of the week you would like to hold meetings, and ask interested students to return a form with their name, and parents' phone numbers. I always ask if a parent or relative would be able to help during meetings, but this is not required for a student to be a member. This year, all of our members were girls, but in years past, I have usually had at least one boy join too! Once you have the forms returned, you will know out how many members you will have. Now is the time to recruit volunteers to help you. You definitely do not want to do this alone! It’s more fun to have more adults. Ideally, you would have a ratio of 1 volunteer for 2-3 students, depending on the age of the student. So, if you have 6 kids interested, I would look for at least two volunteers to help you. I have advertised for volunteers by word of mouth, posting on volunteer boards, and asking at senior centers. Make sure that they know that they don’t need to be experts at sewing- just basic sewing experience will do. Amazingly, someone always steps forward to help. Again, they will have to fill out forms and have background checks- just standard procedure. Next, you need to figure out what you are going to sew with, and where you will store it. I do not recommend using your own machines, nor transporting machines. 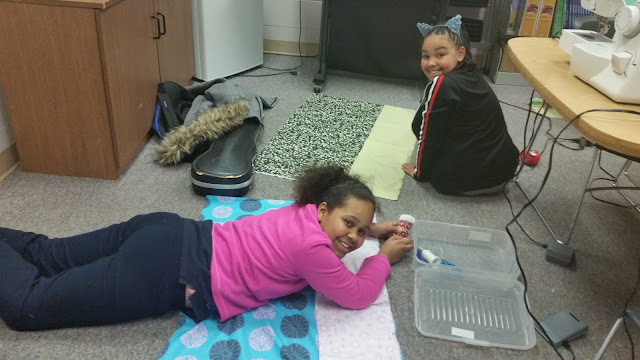 My principal had a specific account for investments in school hardware for after-school programs, and she was able to purchase several inexpensive machines. She also provided me with a storage area and meeting room. Some schools may already have machines in storage from when home economics was taught. I believe that if you asked for donations, you could also find sewing machines easily. Just make sure that the machines are in working order, and light enough for students to carry. Some older models are just too heavy. Figure out how you are going to get other supplies, such as fabrics, pins, scissors, rippers, and tape measures. Garage sales are a great place to start, as well as asking for donations locally. Businesses are also often very generous. 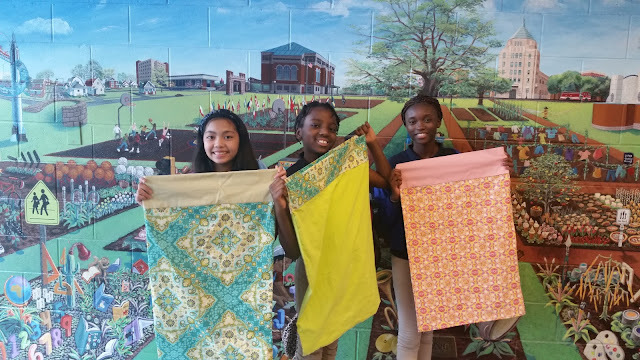 For our club, Fabric Mart donated fabric for projects, and McCall Pattern Company donated patterns. If your students come from a more affluent school, then I would ask parents to contribute towards costs if needed. But, I would certainly be aware that such requirements may make participation impossible in economically challenged schools. Now that you’ve got the support of administration and volunteers, student members and parent approval, and rounded up the basic tools and supplies, it’s time to meet! Let the students know the first meeting day. Here are a few tips that I’ve learned along the way about meeting times. Be strict about start and finish times. 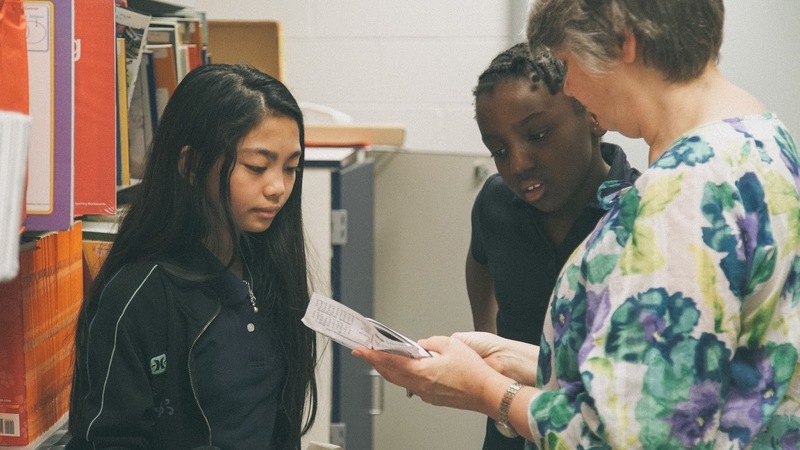 Kids will want to stay longer, but your volunteers may not want to. So, respect the time of the volunteers, and keep an eye on the clock. Set rules and let students know that if they break them, they can’t be a member. I have had to let members go for fighting and for misuse of sewing supplies. Skip the snacks. For the first few years, I thought students needed to refuel after a long day at school before they could start sewing. Snacks were always a hassle and extra expense, and mostly, took a huge chunk of time. So, this last year, I said no snacks. No one complained, meetings went much more smoothly, and we covered a lot more ground. 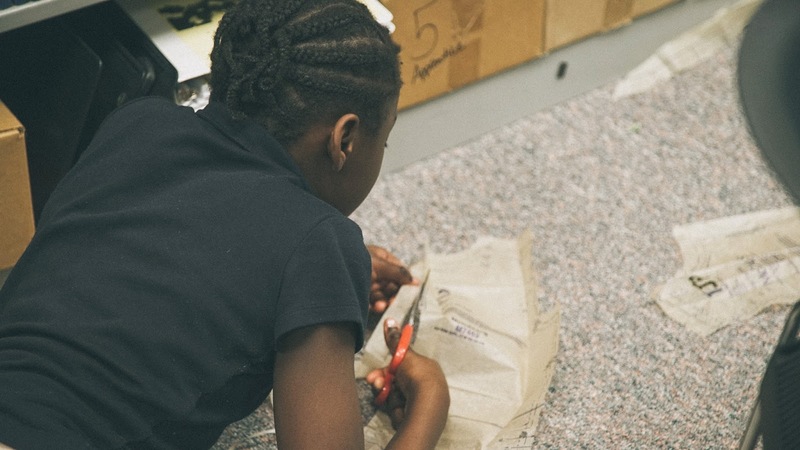 Give each student a box with their supplies and make them take care of it. Maybe even label everything with their names. Kids do well when given responsibility. When there is 5 minutes left, it’s time for students to put things away. For an elementary school, 1 hour is about right. If I were working with older kids, I might go as long as 2 hours. We always start with sewing on paper. 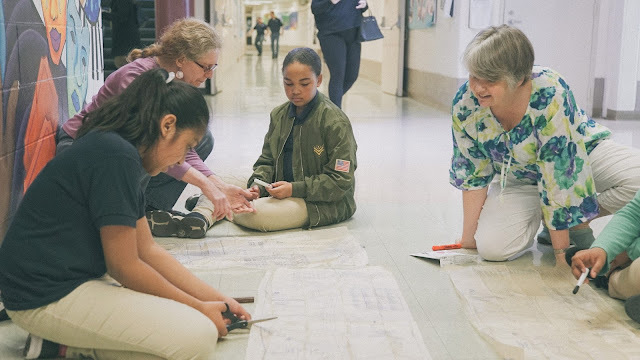 You can find sewing mazes online, print them out, and let them go. Print out extras for the speedy sewers. Students love this exercise. Make sure to spend one meeting on the parts of the sewing machine and how to thread it. I have a diagram of a sewing machine that they have to label the parts on the diagram. By far, the hardest concept to get across is that you have to lower the presser foot when sewing. The name “presser foot” doesn’t make sense to kids, especially since there is also a foot pedal! I often revert to calling it a clamp, which seems to describe its function better. When starting to sew with fabric, I usually cut 5” squares from colorful cotton fabric, and have them make a 9 patch quilt top. If you want, you can use this as a pillow top, back it with a solid fabric, and stuff it with fiberfill. Tote bags, bookmarks, and pillowcases are all things that you can do with rectangles of fabric. I generally pre-cut these things because we really don’t have a good cutting space at the school. Plus it saves time. Make Mom happy by having them sew Mom a present- a heart shaped stuffed pillow, a cosmetic bag, or an infinity scarf are all easy to sew and great gifts. If you don’t have time to plan and prep a project, sometimes just providing a big pile of fabric scraps and letting them have creative freedom is lots and lots of fun. When introducing patterns, choose super simple ones at first. Maybe a drawstring skirt or pajama pants. 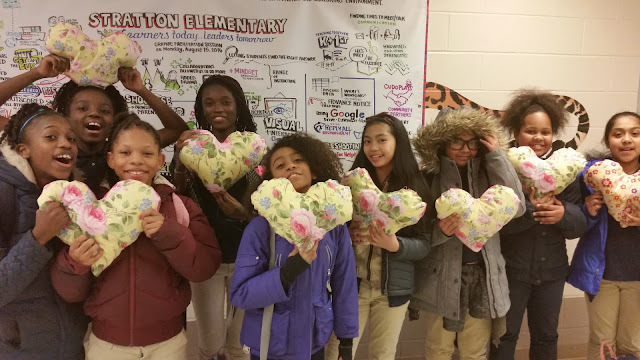 Allow several weeks to complete a pattern project! Kids love to embellish things, so we do lots of iron-on gems, flowers, fabric markers for drawing, etc. 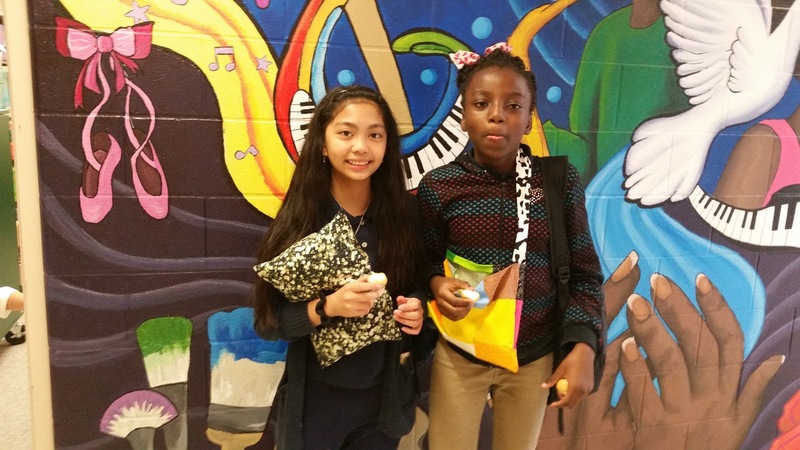 Do something to give back to the school or community. One year, we took a field trip to an adult daycare where the students met the clients and asked them what they wanted. We made adult bibs and walker bags in the residents’ favorite colors. There are tons of things that you can do! Most important- make it fun! Don’t expect perfection, or anything remotely near it. Really, encouraging confidence and creativity is the goal, not getting a perfectly straight seamline. Talk about the things that you make, and show them what is possible! Give them positive feedback on absolutely everything. 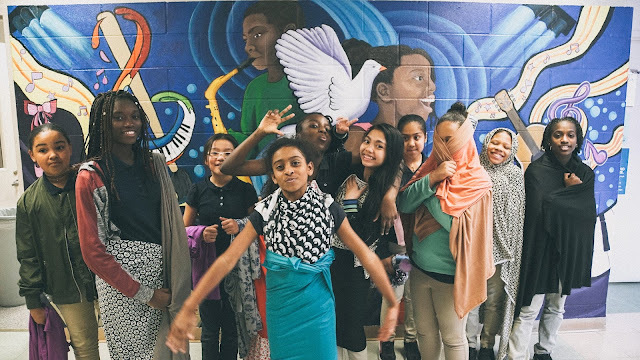 In our schools, 5th grade is the last year of elementary school. 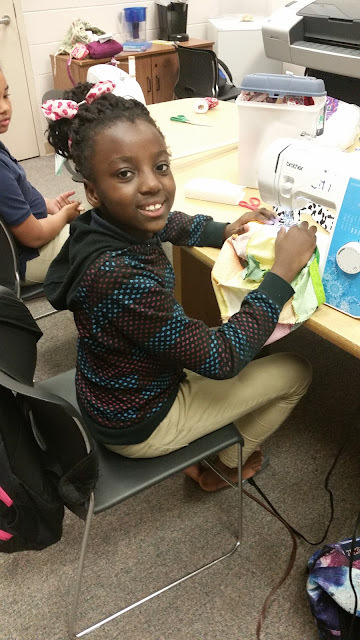 At the last meeting of the year, I overheard our members talking about how sorry they felt for the kids that weren’t in sewing club because sewing club was the BEST part of elementary school, and that they were going to start a sewing club when they went to middle school! So, it may seem like this is a lot of work. And you may be thinking, why would anyone do that for kids they don’t even know? All I can tell you is, yes, it is a lot of work, but it is worth every minute of it. I think my volunteers would agree that they get as much out of it as the kids do. 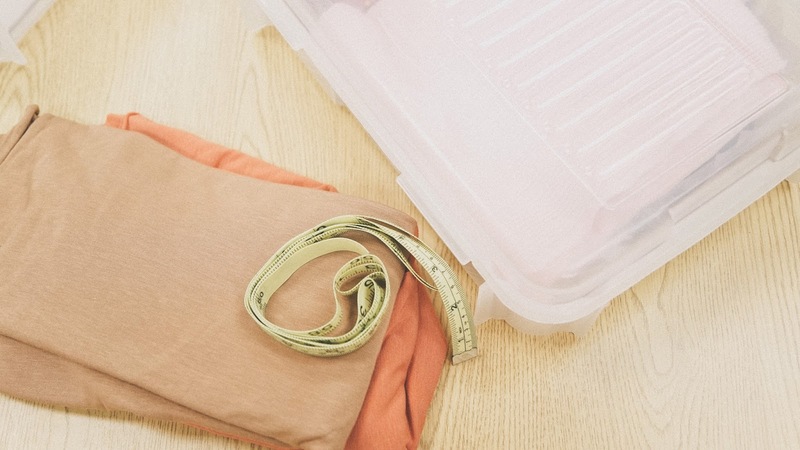 If you love to sew and are up for the challenge, give it a try! You never know what impact you might have on a young person’s life. Ann, I absolutely LOVE this post! LOVE IT! So inspiring, thank you for sharing and what an incredible club. Your commitment to this is inspiring! Great job. Ann, Thanks so much for sharing this information. Our ASG chapter is always looking for ways to reach out to younger sewers and this is a fantastic idea. 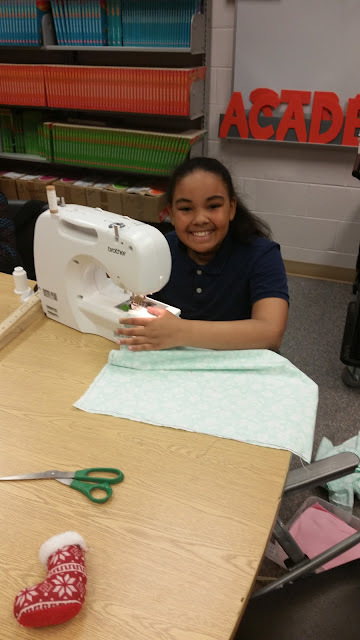 What a wonderful way to help kids learn sewing in a time when many schools no longer have home ec classes, and kids have no one they know who can teach them how to sew. The photos are very touching. I love this! Thank you for sharing! What a gift you are to the kids that you're teaching to sew. From reading this story I feel the compassion that you have for those kids and that you really care. I'm sure that they will never forget you the wonderful lady that introduced and taught them how to sew. Kudos to you Ann for your giving and loving heart!